With our recent renovation, we finished the basement and garage – yay! 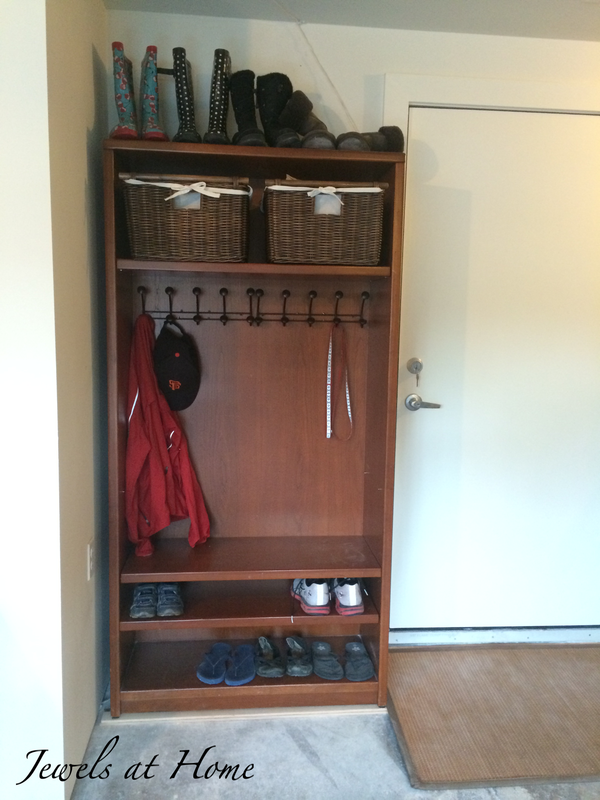 The garage entry gets used quite a bit when the boys are playing out back or running in after school, so I wanted to create a little mudroom area to corral their jackets and shoes. I especially love this project, because it’s made entirely with things we had in the house already! 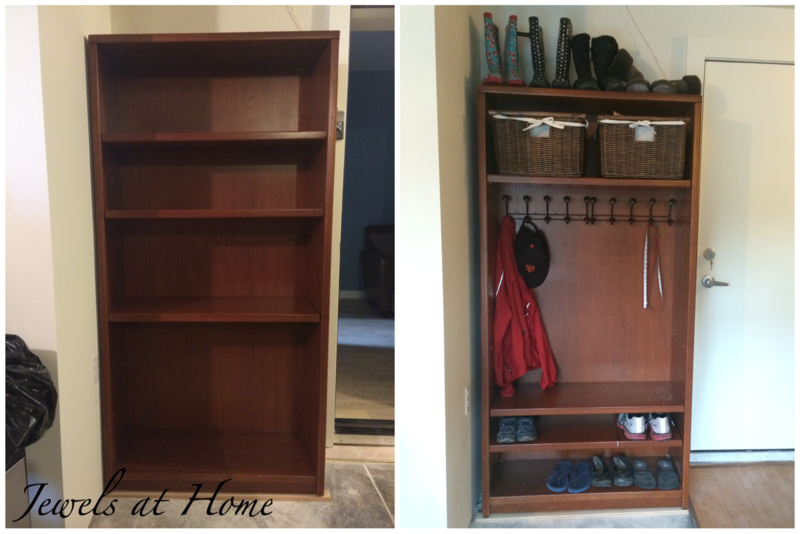 I got the idea for turning a bookcase into a mudroom locker from Melissa at Polka Dot Chair, who did this great project using IKEA Billy bookcases. I was going to do the same thing, when I realized we had all the parts I needed at home. I started with this big heavy bookcase I bought off Craigslist ages ago. I never want to move it again! I shifted the shelves towards the top and bottom – which was perfect, since the bookcase was already missing a shelf, and added hooks for coats and the dog leash. The hooks were from two over-the-door racks we were no longer using. I cut off the hangers and just screwed them in place. The two baskets on top were also repurposed and fit perfectly, holding all the extra soccer cleats and other shoes waiting to be passed down from one brother to another. Finally, we’re lucky to have pretty mild weather here, so I don’t need my boots too often, and the space on top is the perfect place to store them for a rainy day – haha! A bamboo doormat finishes off our garage entry! I’d love to spruce up this area even more by painting the back of the bookcase and the door, but if you could see all the boxes that are half unpacked upstairs, you’d believe me that I’ve got bigger fish to fry! I recently picked up some beautiful wrapping paper at Lavish in Hayes Valley. This is the same store where I found the perfect red and white graphic paper for lining our nursery bookcase. The new paper I found is for my craft room. It’s called Hydrangeas by Kate & Birdie. This company has lots of very sweet original prints – my six year old bought himself a sheet of pirate ship paper while we were in the store. They started in Winnipeg, Canada, so even dearer to my Canadian ex-pat heart. Hydrangeas (WP02) wrapping paper by Kate & Birdie. Click the picture to see their site. The blue, green, and grey color scheme of this paper fits my craft studio perfectly! The blue is just the same as the great print on my newly upholstered Queen Anne chairs, and all the colors are found in the stenciled lampshade I made for that room. I’m amazed what a long way this one sheet can go. For $4, I have enough paper to create several great accessories and accents for my room. I started a clothespin wreath and moved on to these pencil tins – and I still have more projects planned! I love reusing old items, though it’s always a fine line between clever frugality and looking like a preschool art project. I’ve definitely seen more “primitive” versions of these pencil tins, but I like to think that mine fit into the feminine, elegant, slightly funky studio I am creating. 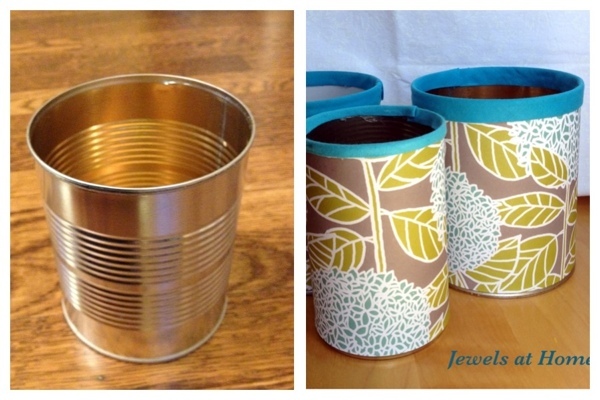 Turn used cans into beautiful pencil tins for your office. This is a very simple and quick project that needs very little explanation. 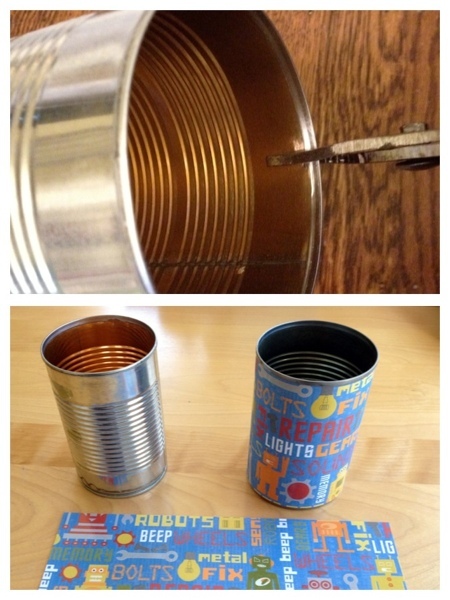 I started by using pliers to flatten any sharp edges along the inside of the can. To cut the paper neatly, I used the quilting ruler and mat I showed in the fabric growth chart tutorial. Flatten the sharp edged on your can. Cut out paper and glue with a glue stick. 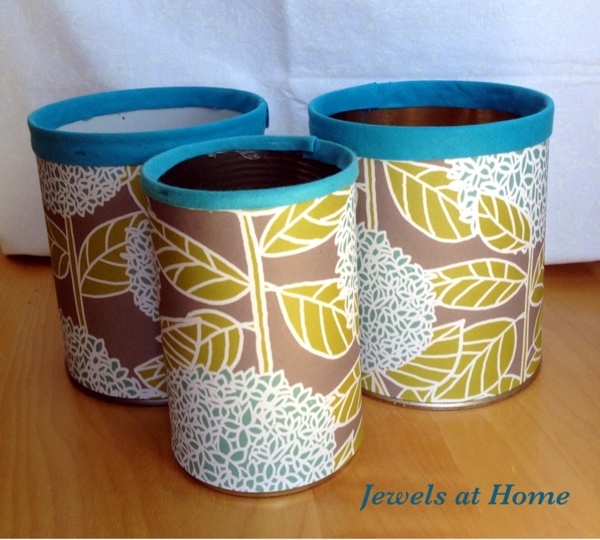 Beautiful pencil tins made from old cans, decorative paper, and bias tape. 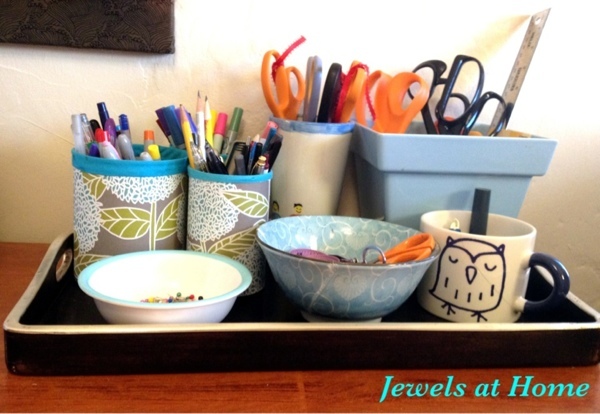 Craft room desk set: DIY pencil tins fit in with ceramics on a vintage tray. 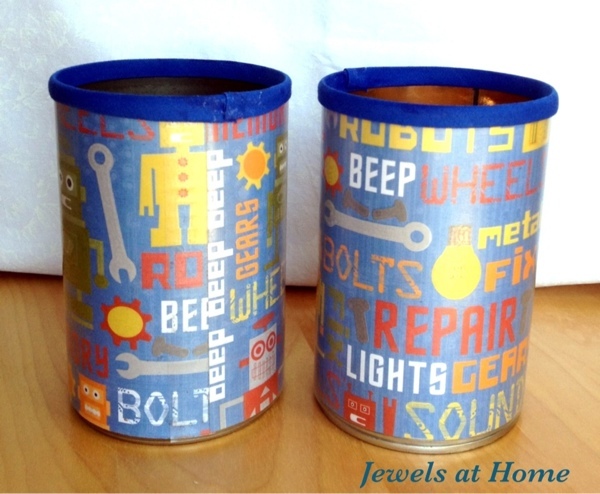 While I was making these tins, I added some for the boys’ homework area. These have a layer of clear contact paper over the scrapbook paper, since I know they will get more (ab)use. Pencil tins for the boys’ homework area. What else do I want to decorate with my beautiful Hydrangeas paper? A pennant banner, some magnets, magazine files, and some storage boxes for the craft studio. Hope to share those projects soon. 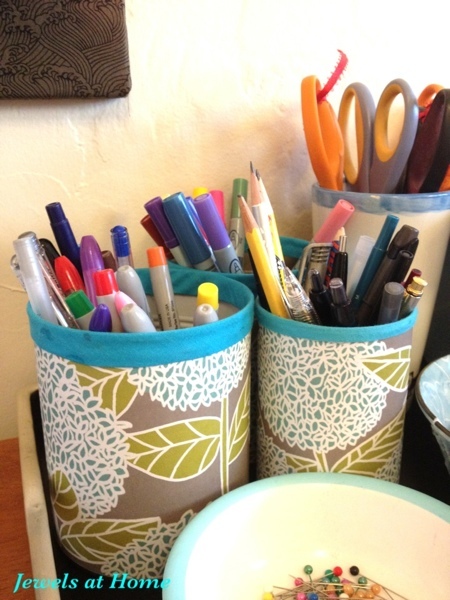 Meanwhile, go raid your recycling bin and make some new accessories for your own office!